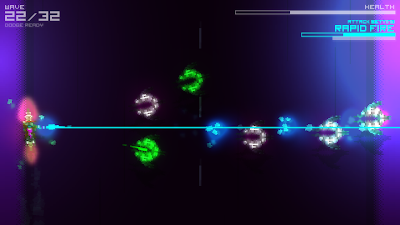 Controlled via a mouse and keyboard combo, Protocol differs from most arena-based shumps in that you can only fire in four directions, and because your weapons automatically target the nearest enemy you are forced to keep moving around the screen in order to strategically take out the more dangerous robots first. 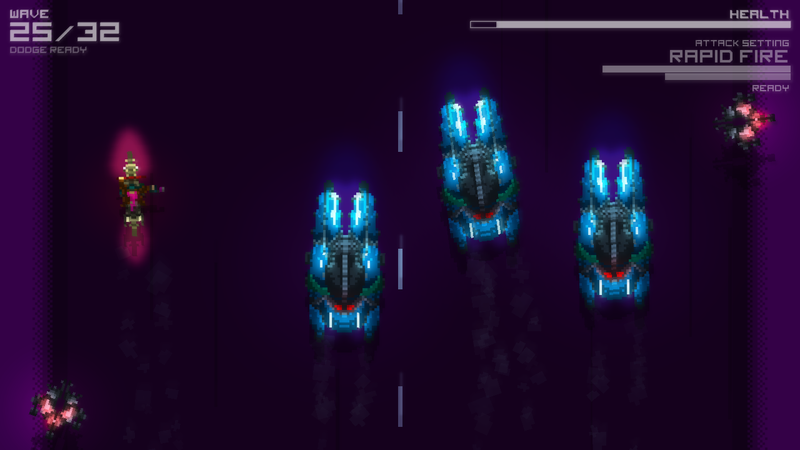 Starting out with lowly Scouters on your tail, as you progress through the checkpoints more enemy types and player skills/weapons are introduced, climaxing in a four-part boss fight. Similarly, Nik's self-composed heavy synth and guitar soundtrack starts off stripped down and slowly builds as you progress through the game - combined with the frantic on-screen action it's an intoxicating experience. The pursuing Lawbots score direct hits with their laser fire pretty much every time (as they should), so you have to be quick in order to complete each of the 32 waves before your health bar depletes. 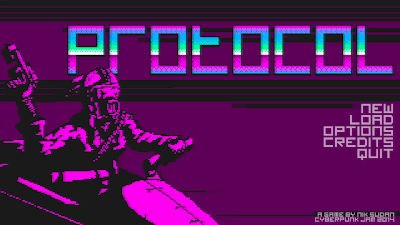 A checkpoint is offered after every four waves, offering an opportunity to recharge whilst the newly unlocked player ability/arsenal is explained. I'm not sure if I was playing it right or not, but I found that to complete some of the later waves I had to resort to keeping the last enemy alive so that my health could slowly regenerate before taking on the next assault - it gets pretty claustrophobic on the road with all those robots zipping about, burning holes through your armour with their relentless laser-fire! 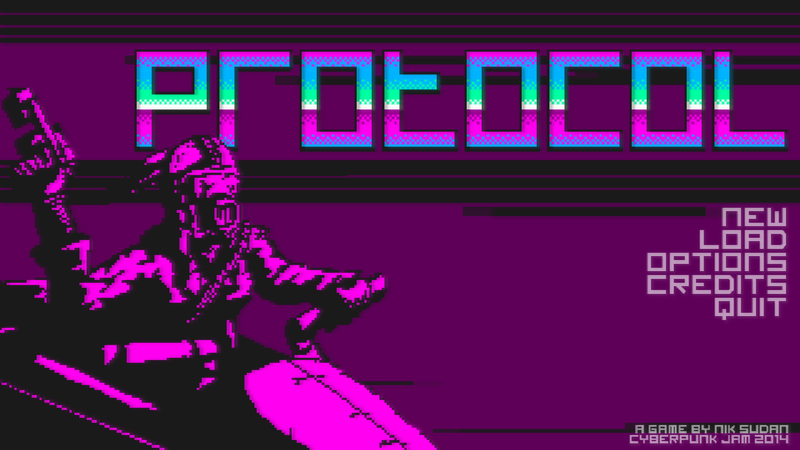 Ultimately though, for all its high points, Protocol does feel like a jam game. It's a little rough in places, the experience is short-lived and with no scoring system implemented there is little incentive to play again after beating it. Despite my efforts in convincing him to flesh out the game further, Nik confessed that he's awful at post-enhancement, and wouldn't make any promises as to Protocol's future. I can't help but feel this is a shame, as I'd personally love to see mankind's war against the machine oppressors concluded. Download the game for free here (from the itch.io page).